He was born in Providence in 1858, the second child of Samuel Pyke and Eleanor “Ella” Fish. His father was a British­born marble cutter, and his mother was a Rhode Island native. His sister Jennie was two years older. James and Eleanor were living at 237 Butler Avenue by 1904, and in that year H.P. Lovecraft and his mother had moved in next door. (The Lovecrafts lived on Angell Street, just around the corner but on the same lot.) Lovecraft was 14 at the time, and admired the older man. Pyke, in turn, is said to have advised Lovecraft on his poetry. They were both sickly and lonely, and were undoubtedly drawn to each other. James was still working at a shoe store in 1906, but must have retired shortly thereafter (to what Lovecraft described as “a quiet life of letters”). James Pyke died in 1935 at the age of 77, after a short illness. He was born in Providence in 1858, the second child of Samuel Pyke and Eleanor “Ella” Fish. 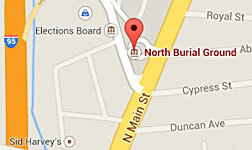 His father was a British-born marble cutter, and his mother was a Rhode Island native. His sister Jennie was two years older. The 1910 Federal census shows the Pykes and the Lovecrafts living in very close proximity. By the time of the 1860 census, Samuel Pyke had become a boot and shoe dealer, a career path he would follow for the rest of his life. James graduated from the University Grammar School in Providence in 1876, and attended Brown University on a scholarship based on his success in Classical Studies in Greek. While at Brown he became a close and lifelong friend of Zechariah Chafee, whose grandson John Chafee and great-grandson Lincoln Chafee would serve Rhode Island, and the nation, in various political roles. He also became a close friend of Gibbs Braislin, who would go on to marry James’ sister Jennie. James graduated from Brown in 1880, and from the Andover (MA) Theological Seminary in 1883, where he served as class poet. He spent the year 1889-1890 teaching at Penn State, where he was an Assistant Instructor in the Preparatory Department for English and Latin, but then appears to have returned to Providence and taken up residence with his parents once more. The city directories still list him as “Rev. Pyke” for a while, but by 1900 he is listed without the honorific, with the profession of shoe clerk, working at his father’s store on South Main Street. In 1904, tragedy hit the Pyke family. 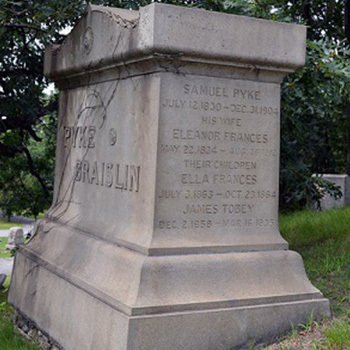 James’ sister, Jennie Pyke Braislin, died of pneumonia in April, and in December Samuel Pyke died. James and Eleanor were living at 237 Butler Avenue, and earlier that year H.P. Lovecraft and his mother had moved in next door. (The Lovecrafts lived on Angell Street, just around the corner but on the same lot.) Lovecraft was 14 at the time, and admired the older man. Pyke, in turn, is said to have advised Lovecraft on his poetry. They were both sickly and lonely, and were undoubtedly drawn to each other. Randy Everts, in his essay entitled “Unknown Friends of H.P. Lovecraft: No. 4, James Tobey Pyke,” surmises that Lovecraft would have admired Pyke’s English ancestry and his “firm Classical background” from his Brown University studies. Eleanor Pyke died in 1912, so James was alone and probably even more drawn to his neighbor who was now an adult, and a rising writer. Perhaps the “cottage” was a summer home to which he repaired regularly? Or it could have been his full-time home after his mother’s death. By the time of the 1920 census, James is listed as one of five “roomers” at the home of an Irish widow at 308 Benefit Street. When Catherine Trainor got out of the rooming house business, he moved to another similar establishment across the street. James Pyke died in 1935 at the age of 77, after a short illness. Brown classmate Zechariah Chafee wrote to fellow classmate Gibbs Braislin that he had talked to Gibbs & Jennie’s son (who was also James’ nephew) and his wife at James’s funeral, and went to supper with them afterwards—so clearly those college friendships survived throughout the years. Everts, Randy. “Unknown Friends of H.P. Lovecraft: No. 4, James Tobey Pyke,” annotated, slightly revised, and with additional pictures by David Haden.Tentaclii : H.P. Lovecraft blog ~ A blog on the famous author H.P. Lovecraft (1890-1937) and his works. 26 July 2014. Joshi, S.T. H.P. Lovecraft: A Life. West Warwick, RI: Necronomicon Press, 1996. Lovecraft, Howard P. “Introducing Mr. James Pyke.” The Conservative, January 1916.